Sin or Win has been out for a month! Amazing. So I decided to throw a “monthiversary” sale. 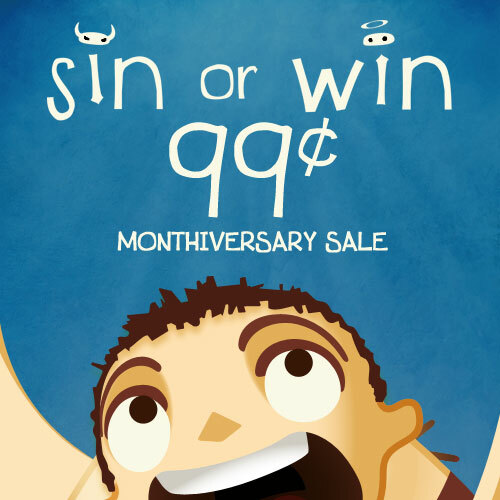 Now, for a limited time, Sin or Win is $0.99. I’m throwing this sale to thank everyone for their patience while I work on making an awesome version 1.1. Sin or Win is currently running smoothly on my 3rd generation iPod Touch, and I’m currently making tweaks to the UI. 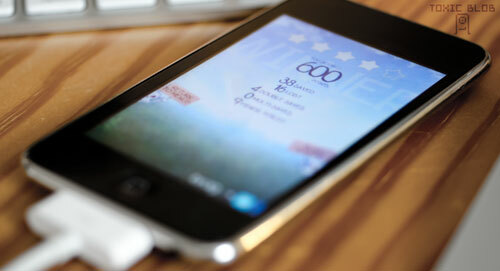 Game Center is also proving fun to bring into the experience. I’m also throwing a few awesome tweaks into the coming update - and a few surprises. While working on 1.1 I’ve also had some really fun ideas for future versions of Sin or Win. I’ve also had ideas for new games as well. Once 1.1 is complete I’m going to spend roughly 20% of my time developing an interesting side project. I have a number of ideas in mind and will likely do quick prototypes of a few before settling on the final idea. Stay tuned! Sin or Win has now been out for a few weeks, and wow, what weeks they’ve been! I’ve been amazed and thrilled by all the wonderful response and feedback I’ve had. Prior to starting Toxic Blob and embarking on making Sin or Win I had no prior experience with game design or game programming. 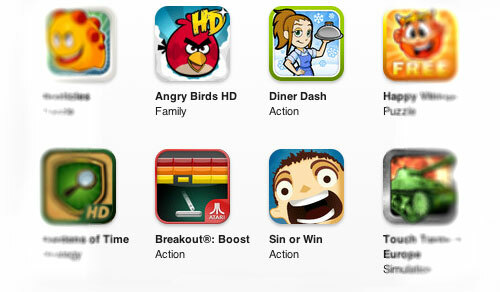 So when I saw Sin or Win hanging out with Angry Birds on iTunes I was absolutely thrilled. I had actually made a game! I’d finished it. It was out in the world with other games for all to enjoy. It’s a dream come true. The reception I’ve had from players and the media has also been thrilling. Sin or Win is currently averaging a 5 star rating on the App Store and I’ve had a wonderful reception from the gaming press as well! Below is a sampling of the media reviews I’ve received. I’m not resting here. I have a lot of really exciting ideas for future updates. Below is an image of one of the little things I’ve been working on. Also, for those that attended my Unite11 talk, Artists as Programmers, I haven’t forgotten you - I’ve just been a little busy. I am hoping to set aside some time over the coming weeks to put the extended talk online. Watch this space. Sin or Win has a release date! Thursday, December 15th. It’s been a wonderful journey. Last year, waiting to board a flight home, my wife and I had a germ of an idea - use the iPad’s wonderfully large touch screen to create an experience that could only be played with fingers. No mice, no trackpads. Something tactile and engaging. Something that paid homage to games I loved as a child, but something that was a new experience. Over the months I worked to realise my vision, continuously making small adjustments in response to player feedback. It’s been a lot of very rewarding hard work. At times the going got very tough, part of me just wanted to abandon the effort. Game development, I learned, is tough. Especially while working solo. Continuously pushing me forward was the wonderful support of my wife, my family and the game community. It’s been incredible meeting so many supportive new friends in the game community. Version one is complete. Version one point one starts tomorrow. I truly hope Sin or Win is just the start of a fantastic new journey. Tagged: Sin or Win, Awesome, I'm Making a Game!